Eighteen years after fleeing Rwanda at the close of the genocide, 13 years after arriving in Canada, and 10 years after being deemed complicit in war crimes and refused asylum here, a Rwandan man who was living in Montreal has been deported. In this September 5, 2011 file photo, Victoire Ingabire wears handcuffs as she listens to the judge during her trial in Kigali, Rwanda. The prosecution of Ingabire for “genocide ideology” and divisionism illustrates the Rwandan government’s unwillingness to tolerate criticism and to accept the role of opposition parties in a democratic society. The courts should not be used for such political purposes. A third opposition party, the Democratic Green Party of Rwanda, has been severely affected by themurder of its vice president in July 2010 and the subsequent decision by its president, Frank Habineza, to flee the country. Like the FDU-Inkingi, the Democratic Green Party has been unable to register in Rwanda, due to a succession of administrative and other obstacles by local and national authorities. In September, Habineza returned to Rwanda to try to register the party once again with a view to participating in the 2013 parliamentary elections. Rwandan opposition leader Victoire Ingabire must get a prompt and fair appeal after being convicted in a trial that fell short of international standards, Amnesty International said today. Ingabire, President of the United Democratic Forces (FDU-Inkingi), was sentenced to eight years in prison on Tuesday. “The trial was marred by the court’s failure to ensure that evidence was properly tested, combined with the prosecution’s disregard for due process in some instances,” said Sarah Jackson, Amnesty International’s Acting Deputy Africa Director. The initial charges in the indictment against Ingabire fell into two broad categories – speech-related charges and terrorism-related charges. The speech-related charges, which were brought against Ingabire on the basis of the expression of her political views, should not have been brought before a court in the first place. Ingabire was today convicted of two updated charges and acquitted of four others. Amnesty International is waiting for confirmation of the precise charges and the applicable laws under which she was tried. 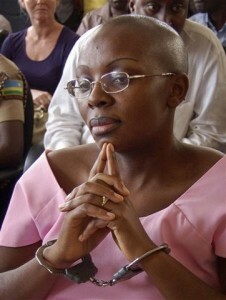 Ingabire was arrested in April 2010, shortly after her return to Rwanda following 16 years in exile. She had hoped to register FDU-Inkingi to stand in the August 2010 presidential elections. The open trial was well attended by human rights activists, journalists and diplomats. Despite international scrutiny, the trial was marred by various violations of due process including: non-disclosure of potentially exculpatory evidence that could have assisted Ingabire’s defence, witness intimidation and interference with the right to remain silent after her notes were seized. The initial terrorism-related charges in the indictment were based, in part, on the testimony of four men tried alongside Ingabire. The men all pleaded guilty and testified against her. Major Vital Uwumuremyi, Lieutenant Colonel Tharcisse Nditurende, Lieutenant Colonel Noel Habiyaremye, and Captain Jean Marie Vianney Karuta confessed to past involvement with the Democratic Forces for the Liberation of Rwanda (FDLR), an armed opposition group in the neighbouring Democratic Republic of Congo (DRC). The prosecution alleged that Ingabire worked with the co-accused men to try to form an armed opposition group, the Coalition of Defence Forces (CDF). The co-accused said that she held meetings with them in the DRC and Republic of Congo. They also alleged that Ingabire transferred money to them by Western Union through third parties. The court did not properly test oral evidence given by the co-accused and it prevented the defence from properly cross-examining them. During limited questions that the court permitted the defence, it materialized that Nditurende and Habyaremye were unlawfully detained by the Rwandan military before incriminating Ingabire. They were interviewed at Camp Kami by intelligence agents without the presence of a lawyer. The court made no effort to obtain notes of these interviews which may have assisted Ingabire’s defence. The judges prevented the defence from asking questions about detention conditions in Camp Kami, including to clarify if the co-accusers’ evidence had been coerced or induced. A key defence witness, Lieutenant Colonel Michel Habimana, who might have shed light on events at Camp Kami, was intimidated by the prosecution. He said that he had been held there at the same time as Major Vital Uwumuremyi and that the terrorism-related accusations against Ingabire were fabricated under coercion from state security. After testifying in court, Habimana, a former FDLR spokesperson serving a life sentence for genocide, had his prison cell searched. The prosecution submitted Habimana’s notes seized in the search, as evidence. They claim that the notes demonstrate that Ingabire’s defence lawyer improperly prepared the witness. Ingabire withdrew from the trial after this incident, claiming that other defence witnesses could not testify in safety and that this undermined her right to a fair trial. “If the prosecution had doubts about the credibility of a witness, they should have asked to question him,” said Jackson. Amnesty International’s observation of the Ingabire trial focused on adherence to fair trial standards. The organization does not take a position on Ingabire’s innocence or guilt on the terrorism charges. Amnesty International appointed an independent trial monitor who was present for all but four days of the trial and compiled a detailed record of court proceedings. The organization considers that the trial fell short of complying with various fair trial standards. The court’s failure to ensure that oral evidence of Ingabire’s co-accused was properly tested is particularly concerning given their unlawful detention by the Rwandan military. Amnesty International’s October 2012 report, Rwanda: Shrouded in Secrecy: Illegal Detention and Torture by Military Intelligence, detailed credible allegations of torture at Camp Kami. The Rwandan authorities dismissed these allegations without investigation. Source: Amnesty International – AI Index: PRE01/523/2012. KIGALI — Rwandan opposition leader Victoire Ingabire was jailed for eight years Tuesday after a court found her guilty of terror charges and denying the genocide. Rulisa said the leader was found guilty of the “crime of conspiracy in harming authorities through terrorism and war” as well as denial of Rwanda’s 1994 genocide. The genocide denial charges against Ingabire were triggered by remarks she made in January 2010 at the memorial to the estimated 800,000 people, the majority of them Tutsis, who were killed in the slaughter. Ingabire, herself a Hutu and the leader of the Unified Democratic Forces (FDU), a political grouping that has not been allowed to register as a party, said it was time Hutu war victims were also commemorated. She refused to attend the hearing on Tuesday, and chose to remain in jail where she has been held since October 2010. During the trial, prosecutors showed what they said was evidence of Ingabire’s “terrorist” activities, including proof of financial transfers to the FDLR, a Hutu rebel movement based in neighbouring Democratic Republic of Congo. Ingabire’s FDU have accused Kigali of fabricating evidence against its leader to prevent her from participating in the political life of the small central African country. She boycotted her trial mid-way through proceedings after the court cut short a witness who accused the Rwandan authorities of rigging evidence against her. The witness, a former spokesman of the Hutu rebel group the Democratic Forces for the Liberation of Rwanda (FDLR), said Rwandan intelligence services had offered money to rebels to make false claims over Ingabire’s ties with the group. Human rights groups have criticized Britain for handing the Rwandan government $ 26 million in aid, after most international donors had frozen payments because of allegations that Rwanda was supporting a rebellion in the Democratic Republic of Congo. PARIS, Oct 21 (Reuters) – Rwanda is brushing aside allegations it is fomenting rebellion in neighbouring Congo, confident that foreign donors are reluctant to abandon a country on its way to becoming a rare African success story. The gamble is a risky one for a state that relies on aid for 40 percent of its budget, but Rwanda’s newly-awarded seat on the United Nations Security Council will boost its diplomatic clout and could further discourage any moves to cut assistance. “They’ve made the calculation that they won’t be isolated or ostracised. And if they lose some donor support, they can absorb that,” said Mark Schroeder of U.S.-based consultancy Stratfor, a long-time watcher of Africa’s Great Lakes region. Pressure on donors to act grew this week after a leaked U.N. Group of Experts’ report accused Rwanda’s defence minister of commanding a six-month rebellion in the east of Congo, the strongest in a series of allegations that Rwanda is involved. Congo’s eastern Kivu provinces are strategically vital to Rwanda. They are home to an established community of Rwandan speakers and a lucrative trade in coltan, tin, gold and other minerals just hours by road from the Rwandan capital Kigali. While Rwanda has backed armed movements in Congo during the past two decades, citing a need to tackle Rwandan rebels operating out of Congo’s eastern hills, it firmly denies the latest allegations of interference. Donors treat such denials with scepticism. The United States, the biggest giver with grants of $173 million in 2010, has already frozen some aid along with Sweden, the Netherlands and the European Union. Yet while Western governments this week repeated concerns over a rebellion that has already forced half a million people to flee their homes, none contacted by Reuters after the leaked report have so far signalled moves to further suspend aid. A defiant Rwanda has rejected the Experts’ report as flawed and warned donors that any step to pull aid would be a mistake. President Paul Kagame hailed Thursday’s award of a Security Council seat as proof the former Belgian colony is on the right track, nearly two decades after a 1994 genocide in which 800,000 Rwandans were killed by a Hutu-led government and ethnic militias. Rwanda’s gleaming highways, modern airport and efficient army – a reliable contributor to U.N. peacekeeping in Africa – are a far cry from the chaos in Congo and the decrepit infrastructure of many African states with less tormented pasts. Kagame’s authoritarian style and allegations by human rights groups that Rwandan military intelligence services have engaged in torture are a cause of international discomfort. But aid partners like the fact that Rwanda’s strong governance means they can see where their money is going. Total aid has more than trebled over the past decade to around $900 million in 2010. “Every pound that goes into Rwanda stands a better chance of being spent on poverty reduction than it does anywhere else,” Malcolm Bruce, head of British parliament’s International Development Committee, told Reuters. “Perhaps there’s also a residual guilt over the failure to act over the Rwandan genocide,” added Bruce, whose government is Rwanda’s second largest bilateral donor with disbursements of $78 million in 2010 and which, for now, is maintaining aid. The question now is how far the goodwill can stretch. It will become harder for donors to justify business as usual if a U.N. committee in coming weeks acts on the Group of Experts’ findings and imposes targeted sanctions against Rwandan Defence Minister James Kabarebe. Belgium, the third largest bilateral donor, which disbursed 56 million euros ($73 million) last year, will review its position if the U.N. does impose sanctions, or the European Union takes further steps on aid, a foreign ministry spokesman said on Friday. The European Commission said on Friday it was awaiting the decision of the United Nations’ sanctions committee. But it added it was “firmly committed” to helping Rwanda tackle poverty and praised the government for progress made so far. The U.S. State Department said it would not comment until the Experts’ report was made officially public, while France – which channels some 43 million euros of aid to Rwanda through the EU and other agencies – said it had no plans to suspend it. A spokeswoman for British Prime Minister David Cameron said authorities would study the issue before any new decisions on aid fall due in December. Diplomats acknowledge that Rwanda’s U.N. Security Council seat may make donors even more reluctant to pull aid. Typically, such countries are courted for their votes on divisive issues such as last year’s Western-backed intervention in Libya. Thierry Vircoulon of the International Crisis Group think-tank suggested that any future moves would be at most partial. “They could cut general budget support to avoid providing military assistance but would continue support for education, health and agriculture,” he said. That might be a risk Rwanda is prepared to run, given the importance of the east of Congo. Past U.N. reports have cited lucrative smuggling rackets of minerals ferried across to Rwanda. At the height of Congo’s last war in 1999, profits from eastern Congo’s mineral fields added some $320 million to Rwanda’s defence budget, U.N. experts said. Wealthy Rwandans are being encouraged to donate 10 percent of their salaries into the newly-launched Agaciro Development Fund, whose website says it was created to “improve the level of financial autonomy of Rwanda as a nation”. Oct 19 (Reuters) – Swept up in the mid-1990s in a conflict that has killed an estimated 5 million people, former child soldier Gabriel struggles to reconcile his feelings towards the man who led him into battle, James Kabarebe. “He was very disciplined. He looked after us child soldiers. He took time to speak to us,” Gabriel, who was 12 when he became a fighter, said of Kabarebe, Rwanda’s defence minister, who was accused by the United Nations this week of fomenting war in neighbouring Congo. “But when someone comes and makes war, and uses child soldiers, he can’t leave anything but bad memories behind him,” said the former fighter, who asked that his name be changed to protect his identity. Right-hand man to Rwandan President Paul Kagame, Kabarebe, 53, for two decades has been a central figure shaping the often violent history of the Central African region. He is celebrated as a hero at home for helping lead the Rwandan Patriotic Front (RPF) advance that stopped the 1994 Rwandan genocide in which some 800,000 Tutsis and moderate Hutus were massacred by the army and Hutu extremist militias. The war lifted Kagame to power in Kigali, and Kabarebe along with him. Across the border in the vastly larger Democratic Republic of Congo, however, Kabarebe is almost universally reviled for his role in destabilising the mineral-rich but almost ungovernable country at a cost of several million lives. Rwanda vigorously denies the latest allegations contained in the report of a panel charged with monitoring Congo’s arms embargo, which said Kabarebe has armed and given military backing to the M23 rebel movement. Fighting between M23 and Congo’s army has displaced nearly a half million people. The Tutsi-dominated insurgency, which took up arms in April, is expanding its control over parts of North Kivu province with additional financing from Rwandan businessmen trading in smuggled Congolese minerals, the report stated. Earlier findings in an interim report by the experts led to a freezing of some foreign aid by the United States, Britain, the European Union, Sweden and the Netherlands. Repeated attempts by Reuters to obtain comment from, or interviews with, Rwandan officials about the report’s allegations failed to elicit a response. Phone calls and text messages to the defence minister, his spokesman, and his chief of staff all went unanswered. A Rwandan government spokesperson twice declined Reuters’ requests for comment. But those who know Kabarebe and how operates say the U.N.’s findings do not come as a shock. “I’m not the least surprised…He’s smart. He’s able. And heaven knows he knows the territory,” said Daniel Simpson, who was the U.S. ambassador to Kinshasa in 1996. That was the year Kabarebe led a mixed force of gumboot-wearing Rwandans and ragged Congolese recruits 1,500 km (900 miles) across Congo, then known as Zaire, to topple longtime dictator Mobutu Sese Seko. Kigali accused Mobutu of harbouring the instigators of the Rwandan genocide, who had continued to launch raids into Rwanda from Congolese territory. The rebel army met little resistance as Mobutu’s forces crumbled, but it left a trail of massacred Rwandan Hutu refugees in its wake, according to a comprehensive U.N. report on the violence published in 2010. Initially welcomed by the cheering residents of the crumbling riverside capital Kinshasa, Kabarebe was even named head of the army by Mobutu’s successor, Laurent Desire Kabila, the father of current president Joseph Kabila. The alliance didn’t last as Kabila – known popularly as Mzee, the Swahili word for “elder” – balked at Rwanda’s pervasive influence in his new government. The inevitable falling out came in 1998 with Kabila’s order expelling Rwandan troops from Congolese territory. A few weeks later, Kabarebe secretly flew back across the country in a daring operation to seize Kinshasa with a few hundred men. Though the plan was foiled when Angolan troops intervened in support of Kabila, it marked the start of a war whose aftershocks are still felt a decade on and which researchers estimate has cost the lives of more than 5 million people. A 2003 peace deal that officially ended the conflict left Congo with an army cobbled together from dozens of armed groups, among them several with ties to Rwanda. “He has contact with Congolese officers everywhere,” Kifwa said of Kabarebe. In media interviews since the U.N. experts interim report revealed Rwandan links to the rebels, Kabarebe has said he used these contacts in an attempt to stop the M23 mutiny in its infancy. However, the experts say he has instead provided the group with direct military support, facilitated recruitment, transferred weapons and ammunition, and encouraged Congolese soldiers to join the insurgency. “M23’s de facto chain of command…culminates with the Rwandan Minister of Defence General James Kabarebe,” said the experts, who monitor compliance with U.N. sanctions and an arms embargo on the Congo. If the U.N. report is correct and Kabarebe is indeed orchestrating the M23 rebellion, it is unlikely he is acting alone, said Gerard Prunier, an academic who has written histories of both Rwanda’s genocide and the war in Congo. UNITED NATIONS, Oct 19 (Reuters) – The U.N. Security Council intends to impose sanctions on the leaders of the Democratic Republic of Congo’s M23 rebels and others violating an arms embargo on the country, according to a statement the council unanimously adopted on Friday. Rwandan Defense Minister James Kabarebe is commanding the insurgency in eastern Congo that is being armed by Rwanda and Uganda, both of which also sent troops to aid deadly attacks, according to a U.N. experts’ confidential report seen by Reuters on Tuesday. “The Security Council expresses its intention to apply targeted sanctions against the leadership of the M23 and those acting in violation of the sanctions regime and the arms embargo,” the 15-member council said in the statement obtained by Reuters. The council strongly condemned any external support to the M23 rebels, expressed “deep concern at reports indicating that such support continues to be provided to the M23 by neighboring countries” and demanded that it stop immediately. The Security Council’s Group of Experts said in its report that Rwanda and Uganda – despite their strong denials – continued to support M23 rebels in their six-month fight against Congolese government troops. The Congolese government on Wednesday demanded targeted sanctions against Rwandan and Ugandan officials named in the U.N. experts’ report. Rwandan Foreign Minister Louise Mushikiwabo on Thursday dismissed the idea that action should be taken on the basis of a report that she called flawed and untrue. She said the priority was to work out how to pacify the region. “It’s wrong. This report is very problematic so anybody who would want to take action based on that report would be really unfortunate,” Mushikiwabo told Reuters in an interview. Bosco Ntaganda, a former Congolese general wanted by the International Criminal Court for alleged war crimes, controls the rebellion on the ground, and M23 leader Sultani Makenga is in charge of operations and coordination with allied armed groups, the U.N. report said. Ntaganda and Makenga “receive direct military orders from RDF (Rwandan army) Chief of Defense staff General Charles Kayonga, who in turn acts on instructions from Minister of Defense General James Kabarebe,” it said. Uganda and Rwanda have denied the accusations of involvement by the U.N. experts, who monitor compliance with sanctions and an arms embargo on the Congo. They delivered their report to the Security Council’s Congo sanctions committee earlier this month. Nearly half a million people have been displaced due to the fighting. M23 has proven so resilient that one senior U.N. diplomatic source told Reuters that Rwanda has effectively “annexed” mineral-rich eastern Congo thanks to the rebel force. “The Security Council also condemns the attempts by the M23 to establish a parallel administration and to undermine State authority,” it said in Friday’s statement. Rwanda has backed armed movements in the Congo during the past two decades, citing a need to tackle Rwandan rebels operating out of Congo’s eastern hills. The latest rebellion also is being funded by traders in Rwanda who are profiting from tin, tungsten and tantalum smuggled across the border from mines in the eastern DRC, according to the U.N. experts’ report. The accusations have prompted the United States, Sweden and the Netherlands to suspend some aid to Rwanda, which relies on donors for about 40 percent of its budget. Last month the European Union froze further budgetary support to Rwanda. Mushikiwabo said it was “the biggest mistake” for any countries to withdraw aid over the U.N. report. Kagame meets students, ready to hand over power! Rwandan leader Paul Kagame has explained the succession question, saying he would be glad to be succeeded by a President capable of taking the nation another step forward in terms of development. “I am not thinking of someone like me but someone who can do things even better,” Kagame said Friday during an afternoon interaction with Rwandan students in the country and overseas. “Rwandans must be empowered. They must be given opportunities. Future leaders are in this room, my duty is to avail opportunity for all to think differently and move the nation forward,” Kagame inspired the students. The statement shows Kagame’s readiness to hand over power after the expiry of his seven-year term in 2017. He has on several occasions insisted he is relinquishing power despite calls from some members of his party to stay around. “We are talking about leaders in your nation and on your continent-a continent in need of change the must be brought by you. For youth to take proper role in leadership, you must start as early as possible. Don’t wait for tomorrow. Be the leaders today, it’s never too early,” said Kagame. The President also responded to media reports that the International Criminal Court (ICC) officials said he faced prosecution for war crimes in Congo. “There is no justice as such…it is being used to decide fates of societies and nations. Why is your (international community) justice selective? We have our right as members of this community and should fight for it,” he said. Rwanda was on Thursday night elected as non-permanent member on the Security Council despite protests from DRC and South Africa. “What is dubious and controversial is not Rwanda taking its rightful place in the UN, it is the report (that accuses Rwanda of backing M23 rebels) that is dubious,” he observed. “What kind of justice is it when we are first sentenced then asked to respond to the sentence?” he wondered. The President said “those who claim to speak for Rwandans are the ones who rob them of their right- the right to decide” for themselves. “Forward we must go, there is no other way. Challenge yourself to use what you learn to move your country forward. We have our own imperfections; we cannot accept imperfections from other people to double our problems,” he said. The President said youth in Africa, Asia all over the world have the same aspirations; to be the horse riders. “It’s not just about saying no, it’s saying no through what you do. I am not saying it’s simple but we are capable of doing it. Others who think they are ordained to tell others what to do or not to do…you must not accept that,” Kagame appealed to the young generation. “You should become agents of change. Why should you be a secondary global citizen? Kagame said the youth must have the determination and make the choice to be the change agents they are capable of being. 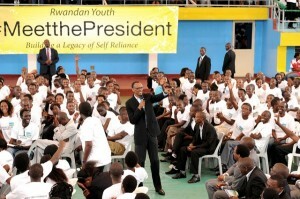 The function was held Petit Stade where the President interacted with more than 2,500 University students in Rwanda. Chimpreports understands students in foreign countries posted questions on Kagame’s Facebook wall while others used Twitter under the hashtag #MeetthePresident. UNITED NATIONS, Oct 18 (Reuters) – Rwanda’s foreign minister warned on Thursday that it would be “the biggest mistake” for any countries to withdraw aid to Kigali over a U.N. report accusing Rwanda’s defense minister of commanding rebels in neighboring Democratic Republic of Congo. The United States, Sweden and the Netherlands have all suspended some aid to Rwanda, which relies on donors for about 40 percent of its budget. Last month the European Union froze further budgetary support to Rwanda. However, Britain unblocked part of its cash in September, praising Rwanda for constructively pursuing peace. “I think Britain has made the right choice,” she said. A confidential report by the Security Council’s “Group of Experts,” seen by Reuters on Tuesday, said Rwanda and Uganda – despite their strong denials – continued to support so-called M23 rebels with arms and troops in their six-month fight against Congolese troops in the east of the country. Mushikiwabo dismissed the idea that action should be taken on the basis of a report that she said was flawed and untrue. She also said Rwanda felt vindicated by its successful election to the Security Council. “It’s wrong. This report is very problematic so anybody who would want to take action based on that report would be really unfortunate,” Mushikiwabo told Reuters. “The priority right now is to look at what it would take first to pacify the region and secondly to look at the root causes and look for ways to solve this problem in a way that would last,” she said. U.N. peacekeeping chief Herve Ladsous said last month that the rebels had set up a de facto administration in eastern Democratic Republic of Congo, controlling the people and collecting taxes. Rwanda has backed armed movements in the Congo over the past two decades, citing a need to tackle Rwandan rebels operating out of Congo’s eastern hills. Bosco Ntaganda, a former Congolese general wanted by the International Criminal Court for alleged war crimes, controls the eastern Congo rebellion on the ground and M23 leader Sultani Makenga is in charge of operations and coordination with allied armed groups, the U.N. report said. Both Ntaganda and Makenga “receive direct military orders from RDF (Rwandan army) Chief of Defense staff General Charles Kayonga, who in turn acts on instructions from Minister of Defense General James Kabarebe,” it said. Mushikiwabo rejected claims in the report that Ntaganda regularly travels to Rwanda. The rebellion also is being funded by traders in Rwanda who are profiting from tin, tungsten and tantalum smuggled across the border from mines in the eastern DRC, according to the U.N. experts’ report.